Current news reports indicate that the average Canadian spends up to 90 percent of each day indoors. Between work, commuting, sleep and meal times, there isn’t a lot of time left to head outdoors. This increase in indoor time wouldn’t be so concerning if our indoor air quality was very good. Unfortunately, recent surveys show that our indoor air quality is not only decreasing each year but is anywhere from two to five times more toxic than the air we breathe in outside. This is worrisome! Now we are spending the vast majority of each day breathing air that is loaded down with toxins, many of which we have introduced into the air ourselves without realizing it. At home, you can largely control what you do and which products you use that may affect your indoor air quality. At work, it is less easy to maintain control over your personal air quality. But there is one guaranteed way to remove toxins from your indoor air wherever you may be, and that is with a HEPA filter. What Is HEPA & Why Does It Matter? HEPA stands for “high efficiency particulate air.” In fact, before the official trademarking process began, the filter’s first name was “the absolute filter”—this as an indication of its amazing effectiveness. HEPA technology was first invented during World War II for the scientists who were working on the creation of the first atomic bomb—to keep them from breathing in potentially radioactive airborne waste matter. HEPA filtration has also been an essential part of the space program’s lunar landings and the invention of the silicon microchip. Fast-forward nearly eight decades into the future and the HEPA filter is still considered the gold standard when it comes to hospital-grade air filtration. A HEPA filter can filter out 99.97 percent of all airborne particulate matter down to the size of 0.3 microns—the width of 1/100th of a single human hair! Today, HEPA filtration is also readily available for use by homeowners and business owners as a part of an ongoing indoor air quality management program. HEPA-rated air conditioners typically carry a MERV (minimum efficiency reporting value) filter rating of 17 to 20. This is a very high rating, considering that all other types of filters can be used only on units with a MERV rating of 16 or lower. Unfortunately, HEPA-rated air conditioners typically will not work well in smaller residential or even commercial spaces. They are simply too big and too powerful and are generally designed to be used in larger settings such as hospitals and laboratories. 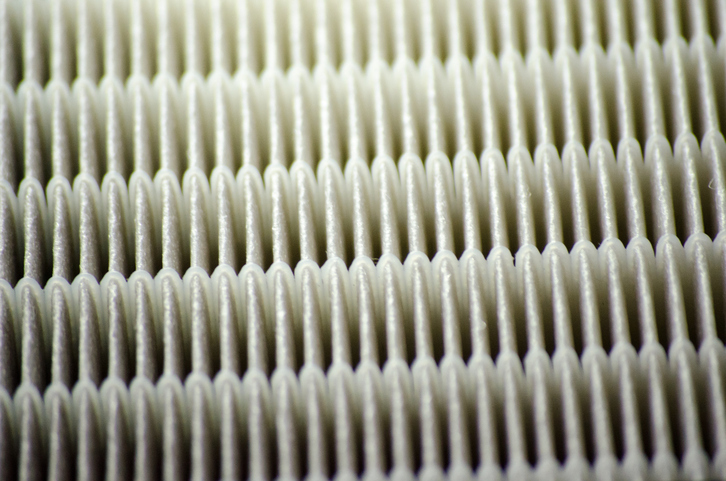 The next best option to a HEPA-rated air conditioner is to opt for a high-efficiency pleated filter, which will work with any regular furnace system rated MERV 5 through MERV 13 and any high-efficiency air conditioner rated between MERV 14 and MERV 16. These filters can still catch the small particulates but won’t catch as many of them as a HEPA filter can. So with this type of filter, instead of a 99.97 percent effectiveness rate, you will be looking at around a 75 percent catch rate. But this is still far better filtration than what you will get with a flat fiberglass or washable reusable air filter! Perhaps the most viable option for whole-space (home or work) indoor air filtration is to add an external HEPA filtration unit to your existing HVAC system. In this situation, the HEPA filter unit is retrofitted to work with your duct system to filter the incoming air after it leaves your air conditioner or furnace but before it enters your air ducts. This way, the toxins are filtered out safely and in a way that will not diminish the efficiency of your HVAC system operation. These units can be retrofitted to work with any type of ducted HVAC system. Yet another workable option for small spaces or non-ducted HVAC systems is to use a portable HEPA filtration unit. These units are usually light enough to be carried from room to room as needed and an individual portable unit may be able to filter the air in a space up to 1,000 square feet. You may want to have one unit you can use at home and another unit you can keep at your workplace. This will be especially useful if your co-workers use tobacco products, burn candles or use harsh commercial cleaning chemicals. BONUS: What About an Ultraviolet Air Purifier? If none of these three options for using HEPA filtration sound like they will work to meet your indoor air quality needs, there is still one more air quality option that just might work! This is the indoor UV air purifier. An indoor air purification system uses ultraviolet C spectrum light to purify the air of all airborne toxins. Our sun emits three bands of ultraviolet light: A, B and C. Of the three types, ultraviolet C is the most powerful ultraviolet light band and the only band that is blocked by the Earth’s ozone layer. Air purifiers also come in whole-home (ducted) devices or portable devices. They are lightweight and easy to install or to carry with you. The ultraviolet light will zap everything in its path and purify your air before you breathe it in. Like the HEPA filter, the ultraviolet air purifier is easy to use and maintain. Are you tired of worrying about the quality of the indoor air you breathe? We can help! Here at Clean Air Solutions Hamilton, our passion and specialty is indoor air quality solutions. Contact us online or give us a call at 905-544-2470 and let us answer all your questions about air filtration and air purification systems, and which ones might work best for your needs.